An archaeological diver measuring the coordinates of some posts during an excavation with the Hydra. The orange buoy contains the measuring devices of the system. The diver is pressing the button to measure the position of a post. Close-up of the diver moving to the next point with the Hydra. This site is under construction. It will soon contain more information about the provided systems. The SUISS-Hydra is a precise underwater surveying instrument to help divers mapping and locating underwater (SUISS = Swiss Underwater Integrated Survey System). It uses the latest technology and has a direct interface for GIS. A flyer of the Hydra is available here. The SUISS-Poseidon (SUISS = Swiss Underwater Information Supervision Software) allows the systematical categorization and management of the measurement data: it is the link to your own geographical information system. The SUISS-Hermes (SUISS = Swiss Underwater Intercom and Security System) is still under development and allows for a two-way communication between divers and a supervisor in a remote position. It greatly enhances the security and also monitors the pressure of the air tank. 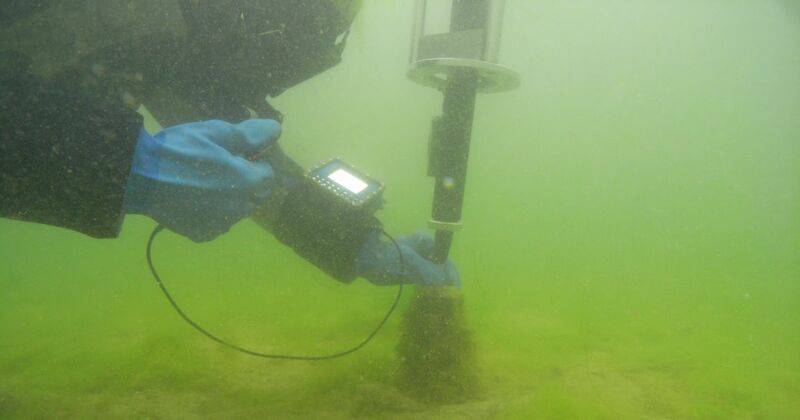 The development of SUISS instruments for archaeological divers is a collaboration between SMT Swiss Mains GmbH and the Underwater Archaeology of Zurich (https://www.stadt-zuerich.ch/hbd/de/index/archaeologie_denkmalpflege_u_baugeschichte/unterwasser.secure.html). If you require more information about the instruments, hard- and software please contact the company SMT Swiss Mains GmbH under the following e-mail address: info@swissmains.com.